A movie night with a twist. This cozy three-screen theater is steeped in San Francisco history, first opening in 1926. The lobby is adorned with old-time paraphernalia and houses video games like Robotron and Donkey Kong. The popcorn still comes doused in real butter. And movies run the gamut from art house films to flash-back double features. The Balboa even hosts occasional events, like a popcorn-eating contest. Your date will definitely be impressed. Saddle up at the bar of this little hole-in-the-wall of a beer spot, and order one for you and one for your significant other. Low lighting and small crowds make the place feel extra intimate, and the bartenders are more than willing to give you and your date a few drink suggestions--though the microbrews are where it's at. Beware: there is usually a long wait here, so if you’re the one to suggest it, make sure you arrive early to snag a table (nothing is worse than waiting out in the cold on a first date). Once inside, however, you can settle in with ease. This cozy den of "food and libation" feature an eye-catching chandelier, and a chalkboard menu of beers and wines beside a mounted stag head. This is also a place where the vino flows from taps and the flatbreads reign supreme. Get to know your date a little better over a pre-movie martini at the cinema bar, or take your cocktails into the theater with you. You can reserve your seats ahead of time (the ones in the balcony are extra spacious and comfy), freeing up time to grab a snack or two in-house before the film starts. For those looking to impress and with a bit more steady cash flow, Bellota is a perfect spot. It’s one of the hottest culinary tickets in town, and yet it’s somehow surprisingly easy to get a reservation for two on short notice. The trick? Booking seats at the bar, which surrounds the open kitchen. It's an experience that's both intimate and entertaining, and the food--refined Spanish eats that include pollo, paella, and ample tapa-size plates--is sure to blow you both away. Stanyan St. and 17th St. 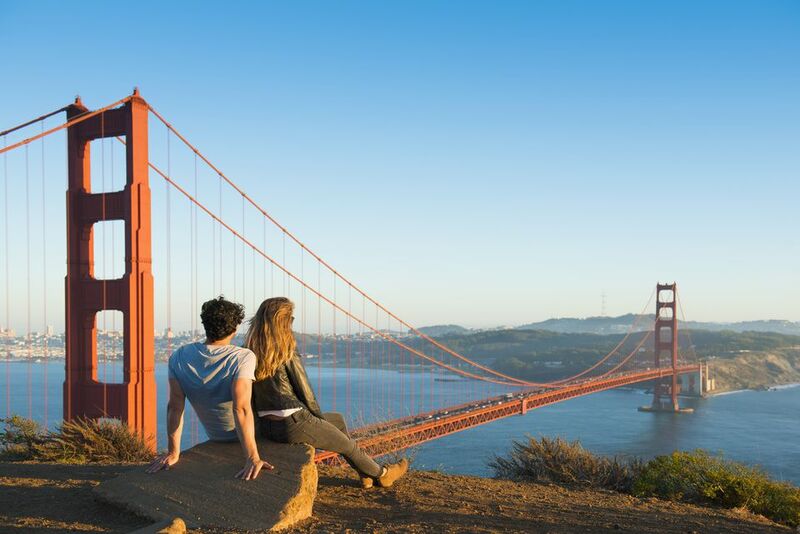 Surprise your date by bringing them to a park that most San Franciscans know very little about: the city's Interior Greenbelt, west of Cole Valley. Local residents more commonly refer to it as "Mt. Sutro," after its primary peak, and it's a whopping 72 acres of trails tucked between eucalyptus forests that has very few visitors, save for the occasional mountain biker and hiker. The trails are non-strenuous and meandering, perfect for a secluded stroll (just keep an eye out for those cyclists). If you’ve got a San Francisco address on your I.D. (or just want to bring along a utility bill), you’ll get into this city treasure in Golden Gate Park for free. Be sure to ask at the entry about what's currently in bloom, then take ample time to stroll through the gardens. There are plenty of scenic park benches for relaxing, and maybe doing a little hand-holding as well. Everything about this bright and casual trattoria says romance, from the abstract artwork of Bay Area painter Shanna Bruschi that hangs on its walls, to plates full of homemade ricotti gnocchi and paccheri with spinach pesto and bottles of prosecco and champagne to share. It's easy to while away an evening here over some vino and carpaccio or an entree of pork scaloppini split for two, followed by one of Ideale's delicious Italian desserts. Although this old-school establishment remains a favorite among both tourists and your parents' crowd, it's a surprisingly low-key and romantic spot for imbibing. Their cocktails are strong and affordable; their low-lying tables and leather-back chairs both cozy and intimate. You'll even get bonus points for snagging a table by the fireplace, although there's plenty of street-side people watching to be had as well.